It’s not quite as strange as Wolf Eyes – but, realistically, who is? Imagine a particularly grim episode of Fringe or even CSI – or imagine playing the computer game Red Dead Redemption – and the tracks here are likely to be featured in the background. Haunting, sparse, and rather experimental, Lupus is more a celebration of sound than a celebration of stadium-rocking tunes, or chart-pop anthems. And this attribute is what demands respect from the listener. It’s minimalist, psychedelic, ethereal – you’re constantly looking out for new sounds, new nuances, and new techniques. From distortion driven riffs, to echoed groaning guitars and finger-picked riffs, everything here demands your attention. With no lyrics, it’s tough to follow at times. With little structure to some of the songs, it can be even tougher. Yet there are repeated refrains and small bridges which keep a focus to the song, slowly edging each one of them along slowly. It’s hard to distinguish each track from one another, but the main stand outs are the really quite scary opener ‘Pharmakon’, the louder and all the more raw ‘Knowledge and Conversation’, and the quite peculiar ‘Wolf of the Bees’. This genre of music is an acquired taste, and it is not going to be for all. But if you stick it out, and can imagine your iPod accompanied walk to work as a scene of darkness and desolation – laced with black and white montages of dramatic images – you just might be in the right mindset for this. It may even become a soundtrack for your life. 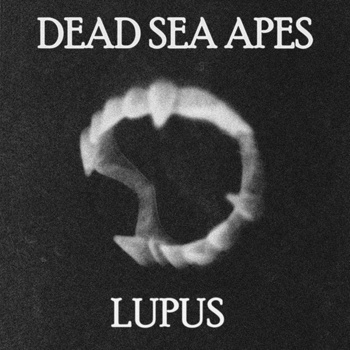 Dead Sea Apes Blog. Facebook. Bandcamp. Last.fm. Twitter. Myspace. Posted in Angry music, Apocalyptic stuff, reviewsTagged Apocalyptic Post Rock, Dead Sea Apes, LupusBookmark the permalink.